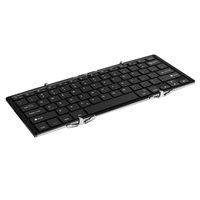 Alurateks Portable Ultra Slim Tri-Fold Bluetooth Keyboard is the perfect accessory to wirelessly transform your tablet into your own personal laptop. Wirelessly connect to any Bluetooth enabled iPhone, smartphones, iPad, tablets, PC laptops and computers for seamless typing and navigation. The lightweight, stylish Bluetooth keyboard allows you to carry it in your bag anywhere you go.